Lauren Tucci’s ceramic and mixed-media works illustrate the artist’s captivation with hypnopompic hallucinations (semiconscious imagery immediately preceding waking up). Human, animal, and non-living objects become symbols in investigations about the self and microsociology. She is most interested in how individuals derive meaning from these amalgamations and what might be gathered from the collective unconscious. Her works have been featured in various publications including Ceramics Monthly and have been exhibited throughout the United States and in Japan. 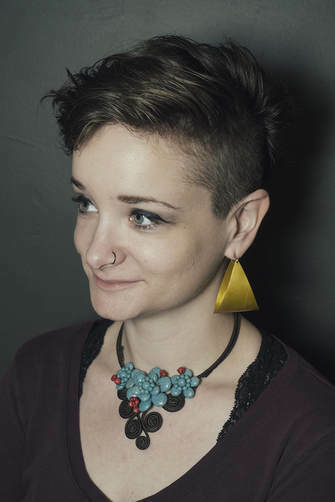 She is the Gallery Assistant and Inventory Manager at Gilded Pear Gallery and her studio is located at the Iowa Ceramics Center and Glass Studio, where she previously attended as a resident artist. She received her Associates Degree in Art at the Community College of Allegheny County and received her Bachelor of Fine Arts with a concentration in Ceramics at Edinboro University of Pennsylvania.